Hanby 8th grade students will participate in the Oregon Healthy Teens Survey on Monday, April 22nd. A notification letter was sent home with 8th grade students with information about it. The Hanby STEM Girls Club is in need of Legos, and are happy to accept donations! If you have extra Lego sets or Legos that your children no longer use that you would like to donate, please bring them to the Hanby Office. Posted in Uncategorized | Comments Off on Got Legos? *There will be open field on Saturdays, 8:30-11:30 AM at US Cellular Fields, field #9. *There will be a parent meeting on February 13th at 7:00 PM in the Scenic Middle School Library. *Tryouts will be held February 24th at 1:00 PM at Anhorn Field. The School Based Health Center (SBHC) at Hanby is located in the main office building basement and is open and operating when the kids are in school. As a result, your student is back in class faster. Additionally, parents do not need to take time off work in order to transport a sick student to the doctor. With easy access to health care in a school setting, we provide a full range of physical, mental and preventative health services to all students, regardless of their ability to pay. Nursing visits are always at no cost. Provider visits, (Nurse Practitioner or Physician by appointment only), laboratory tests, vaccinations, and mental health services will be billed to your insurance or may be based on a sliding fee schedule/ability to pay. The Health Center does not replace your student’s primary care provider, but is an additional resource available to promote your child’s health during school hours. All students seen for medical care need a consent signed by their parent/guardian; these are available in the Hanby Main office and in the Health Center. La Clinica’s phone number is 541-494-6818. PROTECT YOUR CHILD FROM THE FLU! Flu is a contagious respiratory illness caused by influenza viruses that infect the nose, throat, and sometimes the lungs. It can cause mild to severe illness, and at times can lead to death. The best way to prevent flu is by getting a flu vaccine(https://www.cdc.gov/flu/protect/keyfacts.htm) each year. * Not everyone with flu will have a fever. Most experts believe that flu viruses spread mainly by tiny droplets made when people with flu cough, sneeze or talk. These droplets can land in the mouths or noses of people who are nearby. Less often, a person might get flu by touching a surface or object that has flu virus on it and then touching their own mouth, nose or possibly their eyes. You may be able to pass on flu to someone else before you know you are sick, as well as while you are sick. Prevent the spread of flu this season! 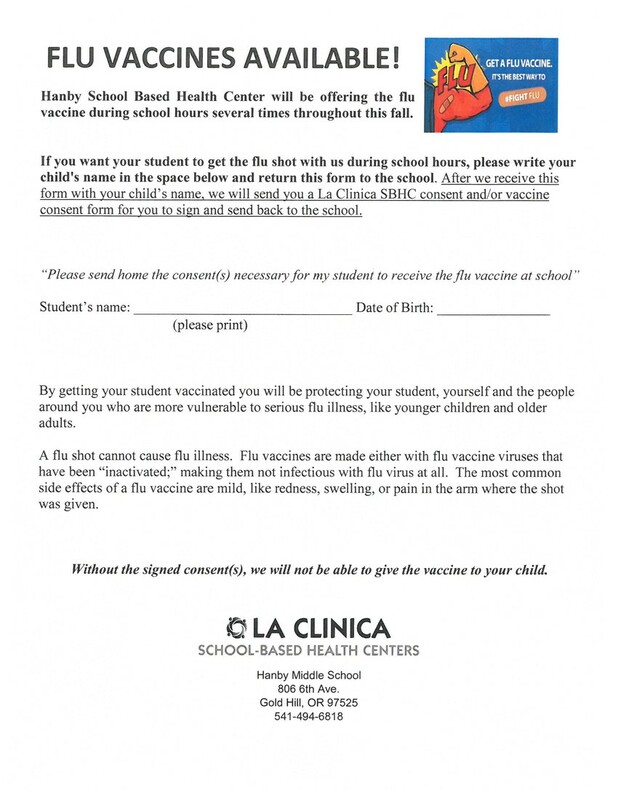 If you would like your student to get the flu shot during school hours, please call the Health Center office at 541-494-6818 to arrange for a consent form to be sent home.